This site has been created to display some of the many views of Blackpool and the surrounding Fylde area. Most images are taken from postcards or CDV cards. We do not have access to early photographs and drawings. Some pictures show the vast appeal of the town and why people visited for several centuries. All items which show the images are owned by myself, unless credited to a third party. Every picture is clear and easy to see, and described in detail where possible. More detailed descriptions will be added in time ! All pictures are clear and easy to see, and described in detail where possible. Some of my images have appeared in books, and more recently on the, Who do you think you are?, TV programme with William Roache, star of Coronation Street. 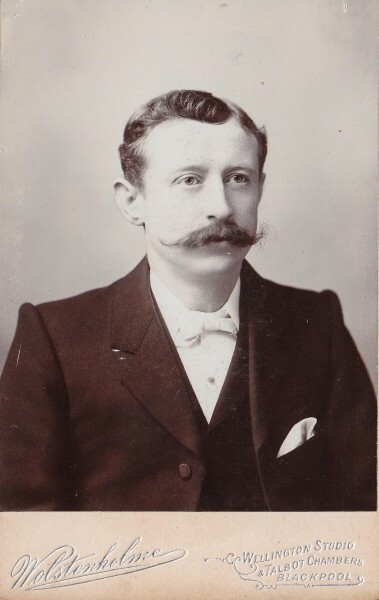 A Cabinet Card from Wolstenholme, Blackpool portrait photographer. The Cabinet card was the style of photograph which was universally adopted for photographic portraiture in 1866 to the 1890’s. It consisted of a thin photograph that was generally mounted on cards measuring 4¼ by 6½ inches. Today this view shows the Funland amusements on the left, with the police station building at the centre of this picture. 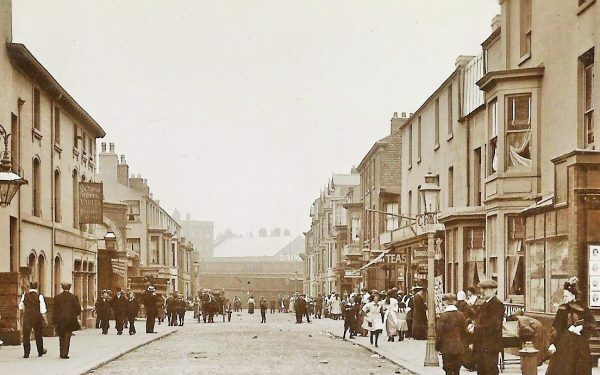 “There seems to be no demand for these in Blackpool”, said the Gazette in July 1898 when the first picture postcards went on sale in Blackpool. This was was hardly surprising as the Post Office was doing its best to stifle the growth of picture postcards in Britain. Whilst on the Continent, especially in Germany, the sending and collecting of picture postcards became a universal pastime during the 1890’s, in Britain the Post Office only allowed cards up to 4.5″ x 3.5″ (court size), an inch shorter than the Continental size. Since the message and picture had to be on the same side, this meant that British cards were a poor compromise between an attractive picture and an adequate space for the message. Then in November 1899, after much lobbying by the postcard trade led by Raphael Tuck & Sons, the Post Office relented and allowed the Continental size, 5.5″ x 3.5″, to be posted. We are always looking to buy quality postcards and related items. If you have any items to sell or offer, please let me know by writing in the Guestbook. This publication was compiled by two dedicated authors and the result is a brilliant book full of rarely seen images. Having this book in your home/office is easier to look at than a Facebook page. Looking beyond the exquisite exterior of these well-kept photos, readers can see the historical context in which they are set and through the author’s factual captions for every picture, and carefully-selected choice of images, the reader can achieve a reliable view of this town’s history.